When I was a teenager I probably would have loved this dark and angsty tale. I think my teen-self would have overlooked the bit of paranormal (I didn't read fantasy as a teen). Amazon affiliate links are used on this link. A free book was provided for honest review. However, as an adult, I felt there was too much angst, but it was really the lack of focus in the plot that had me struggling to finish the book. 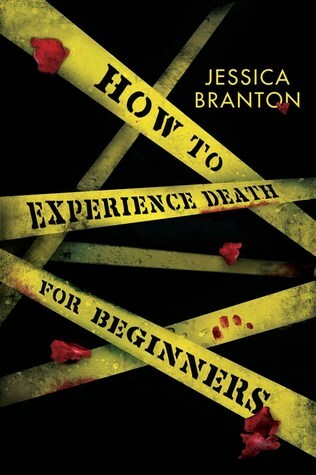 How to Experience Death for Beginners sounded like it had a great premise when the book was pitched to me: a teen with psychic powers helps the FBI solve murders. But then when I started reading it, it was much more about high school angst then I was expecting. Sure there was a murder and Casey experiences the death and eventually, she does work with the FBI sort of - definitely not in the way I thought she would. But all of that seemed to take a backseat to the teen drama. There's a boy who she might like. A lot of the story is focused on their developing relationship. Of course, the local police believe she is somehow involved in the murders which adds to the teen drama. I think that would have been enough tension causing plot. But then a scene is thrown in where her bisexual best friend gets into a fight at the dance and some ensuing drama. Perhaps this was a not so well executed attempt at a red herring. I felt like the story was a bit all over the place. Early on I wondered if this was the second book in a series as I felt like I was dropped into the middle of the story. I even thought that Danny was in on Casey's secret talent, but later it was clear he wasn't. It's not part of a series. At least not yet. I think a sequel is possible. There is definitely more with the characters that can be explored. I thought there were some continuity issues. Such as when she is class and has one of her visions. It had been mentioned earlier in the story that people thought she had epilepsy (that was her cover story). Yet, the nurse and the teacher didn't react as I would suspect them to with an epileptic student. Also, characters kind of disappeared with thin reasons. Tiffany was always away traveling and I'm not sure there was a reason given for Pheobe's absence from the story. It was like she was an afterthought at the end of the book. I would have liked for the titled to have been worked into the story. I think it would have been a nice touch. While I would have liked the plot to have been more focused and streamlined, I did find the characters to be interesting. Perhaps I'm just too far removed from the target audience to fully embrace the story. The fight he gets is because of the comments being made about him being bisexual.